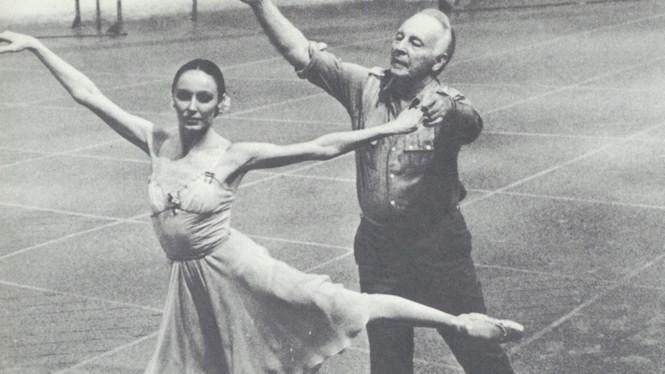 Patricia McBride rehearsing with choreographer George Balanchine. Patricia McBride stood in a ballet studio with George Balanchine and a pianist. This was normal for McBride, then the New York City Ballet’s principal dancer (now the associate artistic director at the Charlotte Ballet), but working with Balanchine would have been a dream come true for aspiring ballerinas around the world. He is known as an artistic genius in the ballet world. A gifted choreographer responsible for changing the face of dance and famous for the New York City Ballet’s ” Coppélia” and “The Nutcracker.” And this man personally invited McBride to join his company when she was just 16 years old. Balanchine and McBride would work alone in a studio, not speaking much. Balanchine would cue the music and dance in front of McBride. A pianist himself, musicality was of the utmost importance to Balanchine. He wanted the dances to flow naturally, so he let the music do the speaking. McBride followed along behind him, learning the steps. Forty-five minutes later, McBride would have a new solo in her repertoire. Balanchine trained McBride for a 30-year career with the New York City Ballet. She danced over 100 ballets in that time, including 30 choreographed just for her. When she performed her final ballet in 1989, McBride was showered with 13,000 roses and a standing ovation. But McBride did not leave dance behind. She went on to teach at Indiana University and then took over the Charlotte Ballet in North Carolina with her husband and dance partner, Jean-Pierre Bonnefoux in 1998. She’s now 72 and still teaches eight ballet classes at a time, on top of running rehearsals for performances like The Nutcracker. This lifelong dedication to dance has been noticed by the outside world, too. Earlier this month, McBride walked down a red carpet in Washington, D.C., to be honored for her commitment to the performing arts. She mingled with Tom Hanks and Sting, had dinner with John Kerry and met the Obamas. She was given a rainbow-colored Kennedy Center Honors ribbon and listened to actress Christine Baranski praise her accomplishments. It was a celebratory weekend all about honoring the ballerina (among other honorees), but McBride was quick to thank others in our interview. Especially Balanchine, her mentor. Theirs was an intimate setting to work in, but Balanchine was more than a teacher to McBride. She looked up to him as a role model and desperately wanted to please him. McBride‘s own father left her family when she was just 3 years old, so Balanchine stepped in to fill that role. “I grew up without a father so he was everything to me — the man I most admired and just the most wonderful role model anyone could have,” McBride said. And their relationship was not lost on the outside world. McBride still remembers leaping for joy when Balanchine invited her to join the New York City Ballet Company all those years ago — and did not hesitate to give up a normal teenage life for one of endless rehearsals, travel and intense dedication. Balanchine was her teacher, her mentor and inspiration during her long-lived dancing career. He pushed her and drove her to perform at the highest possible level, but he was also kind and patient — a notable trait in the perfectionism-driven world of ballet. He was not a man of many words, but when he did offer praise, it stayed with McBride for years to come. Balanchine passed away in 1983, but McBride carries on his legacy by teaching her students his ballets with patience and kindness. She gives her students at the Charlotte Ballet Academy praise and talks highly of her “beautiful dancers.” She believes in nurturing her students and making them feel secure in themselves.